[2nd St has closed up shop before the 2015 ice cream season] Well it's been three months since our last 2nd St. Creamery review so I think it's high time to dig into the other free 2nd St. sample Blue Bunny was nice enough to send over. 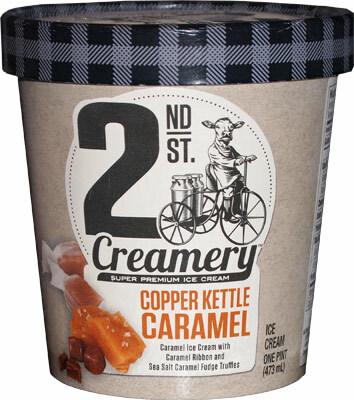 What we've got today is their very popular Copper Kettle Caramel flavor. Billed as "caramel flavored ice cream with caramel ribbon and sea salt fudge truffles", I can only wonder if this will be as sweet, if not sweeter, then their Can't Tell Me No! Cookie Dough. The search for the ultimate caramel flavor continues now! 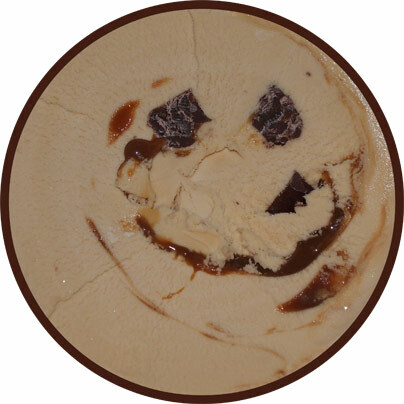 Wait, is my ice cream smiling at me? Well, there certainly are lots and lots and lots of truffles. 1/4" cube after 1/4" cube of spoon filling discoveries. That is a good thing that lasts throughout the entire pint.... Ok, I'll be honest, besides the truffles, I didn't get a huge read on this one the first time I tried it. It wasn't love at first bite, but please understand that I'm not saying it's bad either. I'm just having a little trouble settling into this one because I'm trying too hard to compare it to other caramel flavors I've had. The true second sampling of this one came during my bananas foster breakfast sundae. That was a tasty breakfast and if I learned anything from that experience, it's that this ice cream needs to melt (temper) first. I think that's just the way 2nd St creamery is, it's solid at first and needs time to prepare. The caramel really started to go everywhere and the base became more pliable and fun. I'm going to use this knowledge for one final go at this ice cream. On Second Scoop: Ice cream tempered, let's dig in. Mmmmmm, better. I was over-thinking this one way too much on the first scooping, but once I just let it all blend together a bit, it totally came alive. 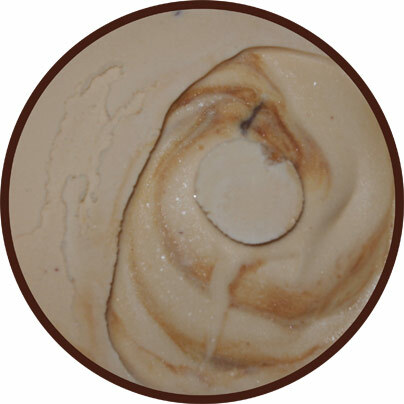 The plentiful truffles are neat, but for me it's the swirl that adds a robust flavor that keeps you scooping for more. I like it, I like it a lot and now I'm sad it's gone. How you didn't love this right off the bat astonishes me to be honest. This may be the single best ice cream I've ever had. I think we are on the same wavelength...I just bought a pint of this three days ago. And now I'm kicking myself for not opening it tonight! @Anon: I've consistently had trouble with eating 2nd St straight from the freezer. Not sure what it is or why it's so solid, but keep in mind that I am at the end of their delivery range so this might be part of it. @Sam: Let us know what you think!